​Heracles was the greatest of the heroes of Greek mythology, a demi-god who battled giants, monsters and men, and yet the manner of his death is not in keeping with his heroic battles. In his life, Heracles fought the most dangerous of monsters, from the Lernaean Hydra to the Nemean Lion, had battled with Gigantes, and had fought against entire armies of mortal men, and yet the manner of his death came about because of the trickery of a centaur and the jealousy of his wife, Deianira. The death of Heracles was also a long time in the making. ​Events begin in the period shortly after Heracles married his third wife, Deianira. Travelling through Aetolia, Heracles and Deianira came to the River Evenus, where the centaur Nessus acted as ferryman, transporting those who required help, across the fast flowing river. Deianira therefore climbed upon the back of the centaur, who carried her across the river. 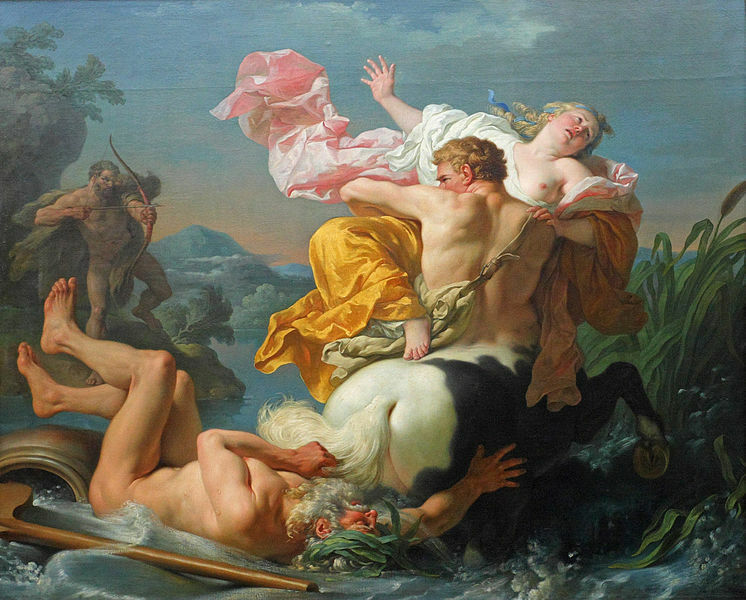 The beauty of Deianira brought the savagery of Nessus to the fore, and the centaur decided to abduct the wife of Heracles so that he could have his way with her. Thus, with Heracles still on the far bank, Nessus made to run off with Deianira still on his back, the screaming of Deianira alerted Heracles to events, and quickly Heracles notched an arrow and let fly. The arrow hit its intended target, and as each of Heracles’ arrows was dipped in the blood of the Lernaean Hydra, poison was soon racking through the body of the centaur. Recognising that his own death was imminent, Nessus plotted his revenge, and before Heracles could cross the river and return to the side of his wife, Nessus was convincing Deianira that the blood stained cloak which Nessus wore, was a powerful love token, and that if Heracles were to wear it, then the love of Heracles for Deianira would be reignited. Deianira was obviously insecure about the fidelity of Heracles already, for without telling Heracles about the words of Nessus, Deianira secreted the Tunic of Nessus amongst her own possessions. ​Years passed by and the insecurity of Deianira came to the fore when she learned that Heracles was returning home with the beautiful Iole, princess of Oechalia, as his concubine. Worried that she was about to be replaced in the affections of Heracles, Deianira remembered the words of Nessus, and so retrieved the Tunic of Nessus from its hiding place. Deianira then gave the tunic to the herald Lichas, telling him to give it to Heracles, so that he might return home in a new shirt. Believing that what he was being presented with was just a normal shirt, Heracles donned the item of clothing, but immediately the poison of the Lernaean Hydra, which was present in the remnants of blood of Nessus, entered the body of Heracles. Wracked with pain, Heracles throws Lichas to his death from a cliff, believing that the herald is responsible for his poisoning. The skin of Heracles starts to flay from his bones, and Heracles recognises that he is dying. ​Tearing up trees, Heracles constructs his own funeral pyre upon Mount Oeta, then the Greek hero lies down upon it. Each passer-by is asked by Heracles to light the funeral pyre, but none is willing to do so until Poeas, the king of Meliboea, came by. Poeas was a former comrade of Heracles, for both has been Argonaut. 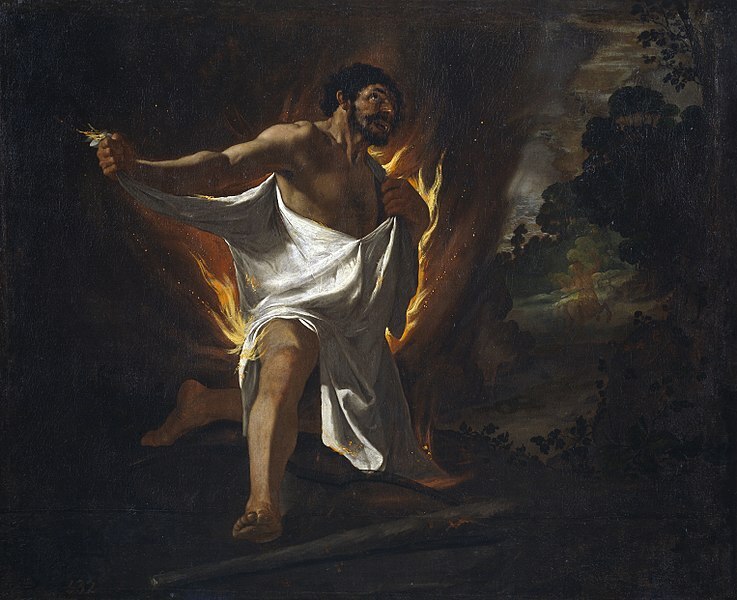 Thus Poeas lights the funeral pyre of Heracles, and as a reward, Heracles gives to his friend his bow and arrow, which were later inherited by Poeas’ son Phiolctetes. ​At the moment of his death, Zeus undertakes the Apotheosis of Heracles, for it had been previously agreed that for his assistance in the Gigantomachy, the son of Zeus would be made a god. 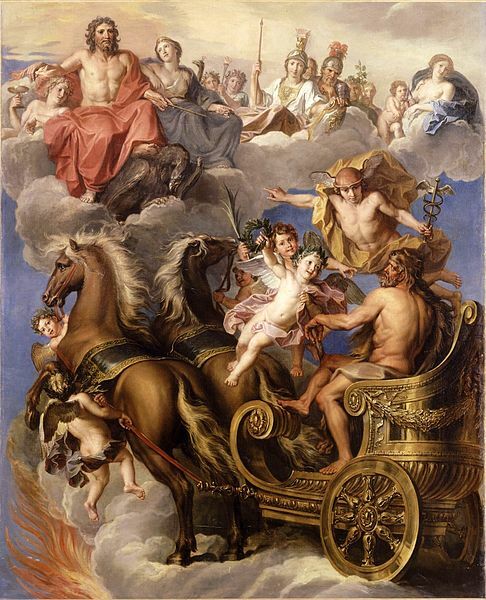 Athena was thus dispatched and upon her chariot, Heracles would be transported to Mount Olympus. Heracles was now a god of the Greek pantheon, and a physical protector of Mount Olympus, and Heracles would wed for the fourth time, for Hebe, daughter of Zeus and Hera became his new wife. Back in the mortal realm though, Deianira becomes aware of how she is responsible for the death of Heracles, and this guilt causes her to take her own life.